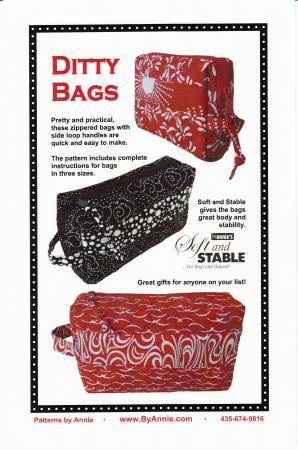 Pretty and practical, these zippered bags with side loophandles are quick and easy to make. By Annie's Soft andStable gives them great body and stability. Includes 3 sizes6-1/2in W x 4in H x 1-1/2in D, 8in W x 4-1/2in H x 2-1/2 D,10in W x 6in W x 3in D. Also use By Annie's 24in zippers.